Here's a couple photos to brighten your day. I actually took these photos last May. Our site manager happened upon a fawn while clearing some downed trees. 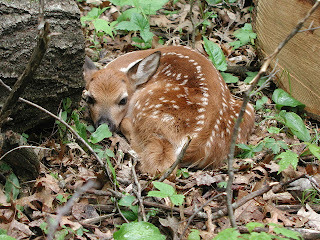 The fawn was wonderfully hidden between two logs just a few feet off our driveway. This fallen tree was cut into sections a few weeks ago and the deer was hiding between two sections. It was a great hiding place. At the bottom of the second photo is a fallen paper birch with sap sucker holes in it. The pattern on the deer's back beautifully resembles the woodpecker's holes. Fawns are usually moved by their mothers to different hiding spots twice a day. 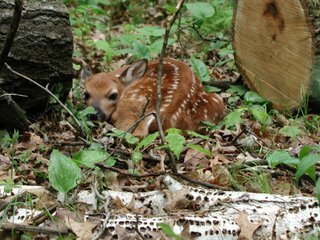 This fawn is likely only a few days old. It was only a little bigger than a house cat.